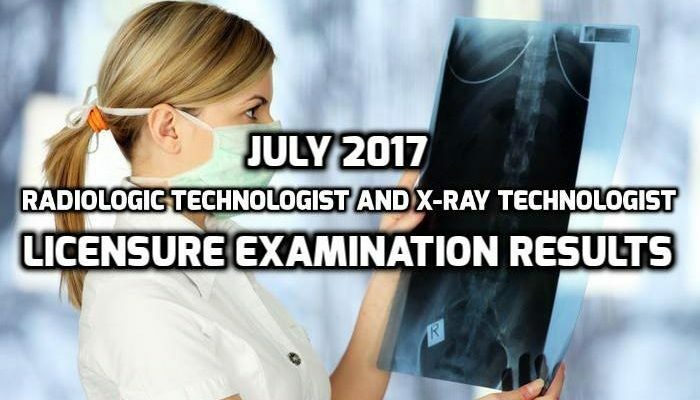 In the recently concluded September 2017 Special Professional Licensure Examination (SPLE) for Radiologic Technologists and X-Ray Technologists held in the Middle East last September 1-2, the Professional Regulation Commission (PRC) already revealed the names of those who successfully passed the board. According to the shared information of PRC, 35 applicants for Radiologic Technologists took the board exam and only 8 of them passed. For the X-Ray Technologists examination, there are 5 applicants and only 1 passed the licensure. The Board of Radiologic Technology administered the concluded examination composed of the designated OIC and board members namely Reynaldo Apolonio S. Tisado (OIC), Bayani C. San Juan, Dr. Orestes P. Monzon as well as Ma. Jesette B. Canales (members). The examinations took place in Doha (Qatar), Abu Dhabi (UAE), Muscat (Oman), Kuwait and in Riyadh and Jeddah (KSA) and released the result on October 12, 2017. For those who passed the board exams, it is advisable to visit the website of PRC (http://www.prc.gov.ph) online to determine the guidelines and necessary instructions. 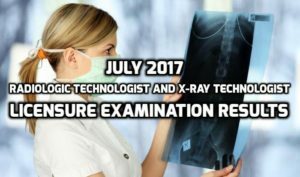 The Professional Regulation Commission (PRC) already released the least of passers for the July 2017 Radiologic Technologist and X-Ray Technologist Licensure Exam after 3 days of the final scheduled board exam on July 31 this year. According to the commission, almost 1,945 passed the scheduled Radiologic Technologist board exam out of 4,195 takers. While for the X-Ray Technologist board exam, about 248 applicants took the examination and only 61 of them passed. The Radiologic Technology Board of the PRC administered the exams from July 30-31 and OIC Mr. Reynaldo Apolonio S. Tisado headed the board exam along with the designated members. The venues for the examination include Baguio City, Cagayan de Oro City, Cebu City, Davao City, Ilollo, Manila, Legazpi City as well as Tuguegarao City in the Philippines.